Herrera Plumbing Service has been providing Plumbing repair, maintenance, remodeling and restoration of plumbing and gas systems, in houston tx. 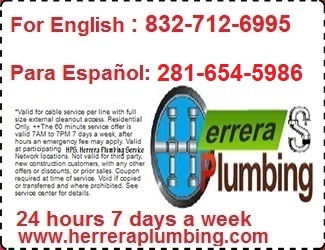 Herrera Plumbing Service, List Of Our Services In Houston TX And Surrounding Areas! Our entire team of Houston based plumbing professionals are on call 24 hours a day, every day of the year. When you need an emergency plumber, we are only a phone call away.